Eat a variety of vegetables, especially dark-green, red and orange varieties, as well as beans and peas. When buying canned vegetables, choose “reduced sodium” or “no salt added” whenever possible. Rinsing whole varieties like beans, corn and peas can also reduce sodium levels. Dried and frozen fruits and those canned in water or their own juice are good options when fresh varieties are not available. Make sure every meal and snack has at least one fruit or vegetable or both. Choose brown rice, barley and oats and other whole grains for your sides and ingredients. Check the ingredients list on food packages to find foods that are made with whole grains. Fat-free and low-fat milk have the same amount of calcium and other essential nutrients as whole milk, but less fat and fewer calories. Eat a variety of foods each week from the protein food group like seafood, nuts and beans, as well as lean meat, poultry and eggs. Eat more plant-based proteins such as nuts, beans, whole grains and whole soy foods like tofu and edamame. At least twice a week, make fish and seafood the protein on your plate. Keep meat and poultry portions lean and limit to three ounces per meal. Drink water instead of sugary drinks like regular sodas, fruit-flavored drinks and sweetened teas and coffees. Choose 100-percent fruit juice. Compare sodium in foods and choose those with the least amount listed on the Nutrition Facts Panel. Season foods with spices or herbs instead of salt. 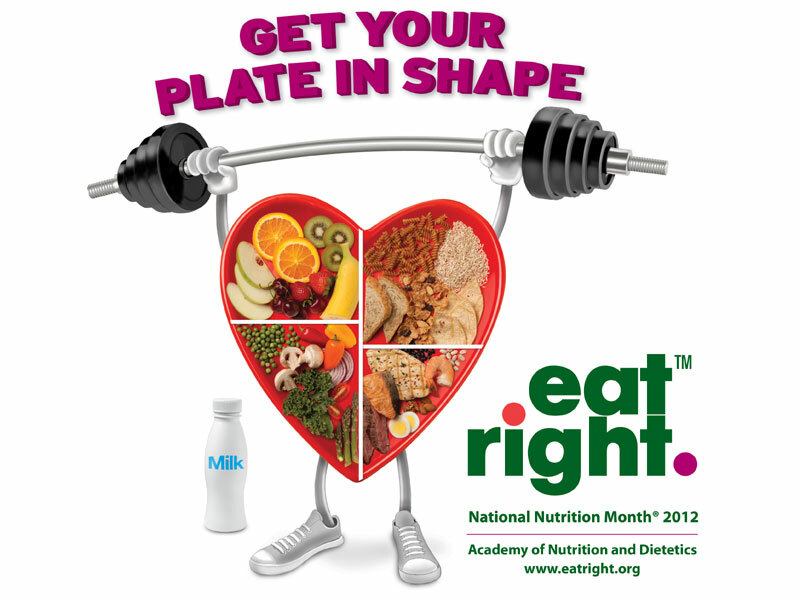 As part of National Nutrition Month, the Academy of Nutrition and Dietetics’ National Nutrition Month website includes helpful tips, recipes, fun games, promotional tools and nutrition education resources, all designed to spread the message of good nutrition around the “Get Your Plate in Shape” theme. Flu season is upon us. As my eyes swell shut and my throat feels like daggers, I am reminded that prevention is the best medicine (along with laughter, but that’s another story). If you want to avoid the flu this season, check out what WomansDay has to say in their October issue. They offer up really practical advice about how to avoid germs in public places, including bathroom stalls (always opt for the stalls on either end of the row. They are used less – statistically speaking). Remember to wipe down those frequently used items like your phone and your remote control. Believe it or not, they house bacteria, just like your kitchen sponge. Believe me. Once you read the article on how to avoid germs, you will never use the same sponge for wiping counters as for cleaning dishes! The movie Contagion is all the rage right now (thanks, Gwyneth!). But there is another kind of contagion we need to be thinking about as we enter the flu season. Family Values @ Work, a national network of state coalitions fighting for paid sick days and paid family leave, created a great seven-minute video that highlights just a few examples of the 44 million Americans who have gone to work sick because they couldn’t afford to stay home. During the H1N1 outbreak, 7 million Americans caught the flu from their co-workers, due in large part because of the lack of paid sick days. More than 44 million workers do not have paid sick days while only 19 percent of low-wage workers have access to any paid sick days at all. Workers earning low-wages are the least likely to have paid sick days. Many workers with a significant interaction with the public do not have paid sick days. This includes three in four food service workers, three in five personal health care workers and three in four child care workers. 1 in 6 workers have been fired or threatened with being fired for taking time off work to care for a personal or family illness. Let’s help turn the US workplace into a human place to be. In sickness and in health. Intuition, the sweet voice of our internal navigation system.Without it we bumble. With it, we grow humble. Intuition is the guide of consciousness. It’s truly a lovely thing. Jackie Gilbert, Professor of Management in the Middle Tennessee State University College of Business, offers her wisdom about intuition in her guest blog below. Please visit her site, which is chock full of wisdom and thoroughly researched. Besides, she’s a great writer! A healed mind does not plan. It carries out the plans which it receives through listening to Wisdom that is not its own (A Course in Miracles). How often have you felt frustrated as a result of either a failure to plan, or an attempt to plan too much at one time? Our sense of timing, intuition, and content of our very plans are all impacted by our state of mind. I love the following quote from A Course in Miracles:“The mind engaged in planning for itself is occupied in setting up control of future happenings. It does not think that it will be provided for unless it makes its own provisions…The mind that plans is thus refusing to allow for change. What is has learned before becomes the basis for its future goals. Its past experience directs its choice of what will happen. And it does not see that here and now is everything it needs to guarantee a future quite unlike the past without a continuity of any old ideas and sick beliefs. Anticipation plays no part at all, for present confidence directs the way” (p. 210). Intuition and the resulting sense of what to do can be channeled through our deliberate focus. In his study of lucky people, Wiseman (2003) found that they were more relaxed (less anxious) than their non-lucky counterparts. His findings suggest that creating our own future is more a state of mind than of circumstance. At every juncture we have the opportunity to choose our thought, rather than to be controlled by our cognitive wanderings. Buddhists refer to this quality as “mindfulness,” or full attention on a task, absent the background fast forwarding to something else. The Dalai Lama describes mindfulness as the recognition that a negative thought has taken root, an “early warning system of sorts,” and the subsequent desire to change course. The byproduct of relaxation is then the ability to harness our thoughts in a way that is beneficial for our purpose, which is (in large part) to nullify negative voices, and to find our inner guidance system, or intuition. Intuition can also be nurtured through freehand writing in response to pressing questions: e.g. : What should I do next? (Canfield, 2005). The immediate dictation, followed by subsequent directed activity, will facilitate an increasing number of instinctive responses. Journaling permits repressed feelings to surface so that we can take appropriate action, and it promotes catharsis through written self-expression. Hohlbaum (2009) explains journaling as an “unloading” technique, particularly for chronic worriers. When we list every single thing we are worried about, we realize that many of our concerns are inconsequential. Remove mental obstacles so you know what’s truly important, and can refocus on your priorities. When the mind emanates peace employees’ work proceeds effortlessly of its own accord, and they experience the negotissimum otium, or complete leisure that is intense activity (Russell, 1991). Carr-Ruffino (2001), in her book Creative intelligence model: Building innovative skills provides a table of emotions. The more positive emotions are associated with serendipitous occurrences, with insight, and with a “can do” attitude. Conversely, negative emotions lead to learned helplessness, to despair, and to a lack of creativity. Expansive emotions engender a non-combative way of expressing feedback which creates feed forward, or dialogue between two parties where communication is a tool of empowerment. Similarly, Robbins (1980) mentions that “enabling states,” or conditions in which we experience peak resourcefulness, consist of confidence, inner strength, joy, and ecstasy. Positive states are created by the mental images that we conjure forth in our minds. Focus on what’s working in your life. What things are going well at this particular instant, and what actions can you take to create more of the same? Success begets more success, and a desire to work harder to produce results of the same caliber. Keep feeding your productivity engine with positive thoughts. Realize that our thoughts are of our own choosing, and consciously work to eliminate the unwanted. When you sense your mind wandering in a negative direction, choose to refocus. Remember that happiness is in fact a choice. The first six bullet points are from Morgenstern (2009). Canfield, J., Hansen, M. V., & Hewitt, L. (2000). The power of focus: What the world’s greatest achievers know about the secret of financial freedom and success. Deerfield Beach, FL: Health Communications Inc.
Carr-Ruffino, N. (2010). Leading Innovation (p. 127). Boston, MA: Pearson Learning Solutions. DiCarlo, R. (1996). Towards a new worldview: Conversations at the leading edge (p. 149). Erie, PA: Epic Publishing. Hohlbaum, C. L. (2009). 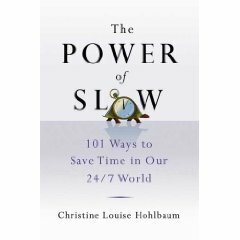 The power of slow: 101 ways to save time in our 24/7 world. New York: St. Martin’s Press. Maltz, M. (1960). Psychocybernetics: A new way to get more living out of life. Englewood Cliffs, NJ: Prentice Hall. Morgenstern, J. (2009). Shed your stuff, change your life: A four step guide to getting unstuck. New York: Simon & Schuster. Robbins, A. (1986). Unlimited power. New York; Fawcett Columbine. Russell, J. B. (1991). A history of heaven: The singing silence. Princeton, N.J.: Princeton University Press.